Late 18th century black lacquered tavern clock by Henry Lane from Bristol. Typical "A" plate weight driven movement, white dial with Roman numerals, with brass hands. Henry Lane was working in Bristol circa 1774-1797. He was convicted of forgery and transported to Australia on HMS Perseus in 1802. He was in business in Sydney by 1803. He was pardoned in 1808, and appointed government clockkeeper from 1811 till he died in 1815. 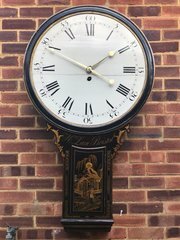 Mid 19th century fusee wall clock numbered 3009SW, made for the London and South Western railway around 1850 and supplied to Tongham station. 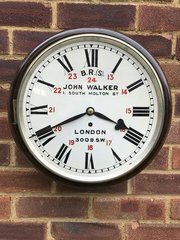 (Between Guildford and Aldershot) The clock with a 12" dial, re painted in 1964 with a 24 hour dial with John Walker, 1, South Molton Street, London, and its number 3009SW. Walker had the repair contract for the Southern region, with an annual repair cost of 3/6d. The case is teak, made in the usual way with backbox secured to the front bezel by 4 pegs. The cast brass bezel, is hinged on the left, with the hinge stamped 3009. The backbox is also stamped 3009 The chain fusee movement frontplate is also stamped 3009. The clock has "T" bar suspension. Tongham station closed to passengers in 1937 and closed completely in 1961. It has since been demolished and is now a housing estate. This clock finished its working life at Crofton Park station. Other images available on request. 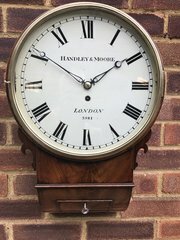 Early 19th century mahogany cased eight day fusee drop dial wall clock by Handley and Moore, London, and numbered 3981. 12" diameter wood dial, with original paint to dial. Typical blued steel hands for this type of clock, protected by a concave glazed, cast brass bezel. Lovely colour to the mahogany veneered case, which has a locking bottom door and side access door. Bezel and dial secured by 4 pegs to backbox. Line fusee movement with shaped shoulderd plates, separated by knopped pillars. Movement held to dial by a circular falseplate. Movement frontplate and spring barrel cap, numbered 3981. George Handley and John Moore, both apprenticed to John Thwaites, were working in Clerkenwell close, 1801-1820. Early 19th century 8 day fusee wall clock by James McCabe, Royal exchange, London. Mahogany two piece case, secured by the usual 4 pegs. Locking bottom door and pendulum side access door. 14" convex original painted dial, with nicely shaped blued steel spade hands. Dial protected by the original convex glazed locking concave cast brass bezel. Heavy "A" plated anchor escapement line fusee movement separated by 4 knopped pillars. Early 18th century lantern clock by John Smorthwait, from Colchester, Essex. Brass posted frame 30 hour single hand movement, striking the hours on a bell. 9" square dial, with silvered brass chapter ring. Engraved dial centre and spandrels. clock has a nice early 20th century oak hanging bracket. Late 17th, early 18th century square dial lantern clock by Francis Perkins from Evesham, Worcestershire. Single hand, 30 hour, rope movement striking the hours on a bell. 10" square dial with silvered chapter ring and cast brass spandrels. Clock has never had usual lantern clock frets or side doors. This clock has an oak hanging bracket. Early 19th century wood dial fusee wall clock by James Edwards, Cheapside, London. 2 piece case and bezel, secured by 4 pegs. Locking bottom door with pendulum side access door. 12" diameter original painted wood dial. Brass "Thwaites and Reed" style hands, and dial protected by glazed locking concave cast brass bezel. "A" plate anchor escapement line fusee movement secured by a cast iron falseplate to the dial. 19th century 8 day fusee wall clock made for a government contract with the dial marked with Queen Victoria's cipher. Mahogany 2 piece case secured with 4 pegs, backbox with locking bottom door and pendulum access side door. 12" diameter original white painted dial also marked with the clock makers name F. D. Cox, 46, Anerley Hill, Upper Norwood. Dial and blued steel hands protected by a spun brass glazed bezel. Square plated movement separated by four pillars. Early 19th century mahogany cased trunk dial fusee wall clock by Jerome Denny Bright, Saxmundham, Suffolk. 2 piece mahogany case, the backbox secured to the slim mahogany surround by 4 pegs. The backbox has a bottom door and pendulum side access door. The bottom door has never had a lock fitted. The 9" original painted dial and blued steel moon pattern hands are protected by a locking convex glazed cast brass bezel. The movement by Thwaites and Reed, is numbered on the frontplate, 9286, which dates it to 1834. The line fusee movement has shaped shouldered plates separated by knopped pillars. 19th century 8 day fusee wall clock by Dent, 33, Cockspur street, London, and numbered 23890. Mahogany 2 piece case, back box and bezel secured by 4 pegs. Back box has locking bottom door and pendulum side access door. 12" diameter original white painted dial marked with Roman numerals, and blued steel hands protected by a locking cast brass bezel. Rectangular plated chain fusee movement. Mahogany cased verge wall clock by John Rapkin from London. Saltbox case with side and bottom access doors. Mahogany surround has the unusual feature of chequer inlay around the circumference. Silvered and engraved brass dial, marked with Roman and Arabic numerals. Blued steel diamond shape hands. Dial protected by a convex glazed locking cast brass bezel. 8 day "A" plate verge fusee movement with knopped pillars.